After the Gold Rush is Neil Young's third solo album and it was released in 1970. 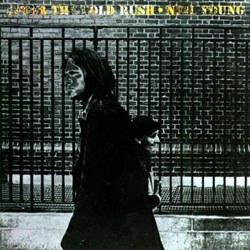 The Album cover shows Neil Young in an urban environment and no longer in the country as the covers of two previous albums. The photography is solarised which gives Neil's face a plastic look. From the first song, the sound is obviously different from Everybody Knows This Is Nowhere with a very clear production and clean acoustic guitar with a mix of strumming and fingerpicking. Sometimes the guitar is replaced with a piano, as in the title song “After the Gold Rush” (at Live at the Cellar Door which featuring live performances from 1970s Neil could be heard saying that he had played piano seriously for just a year). The songs on this album may be harder to like in the beginning compared to Everybody Knows This Is Nowhere, but they get better with every listening. That holds also true regarding the critics acclaim that have grown with time. With After the Gold Rush Neil Young would establish himself as one of the absolute biggest music artists around. Finally, it could be worth mentioning that “Oh Lonesome Me” actually was written by the songwriter and musician Don Gibson.